I got dressed a few times over the holidays; maybe three times. Or four. Stop judging me. Masterpiece Theater doesn’t care if you get out of your pajamas to enjoy a Downton Abbey marathon. I mean, really. On Wednesday though I really did get dressed to go to dinner and a movie with some dear friends, and I figured greasy hair and pajama bottoms might embarrass them in public. I’m a giver is what I am. What are you wearing today? Black on black, or are you into spring colors already? 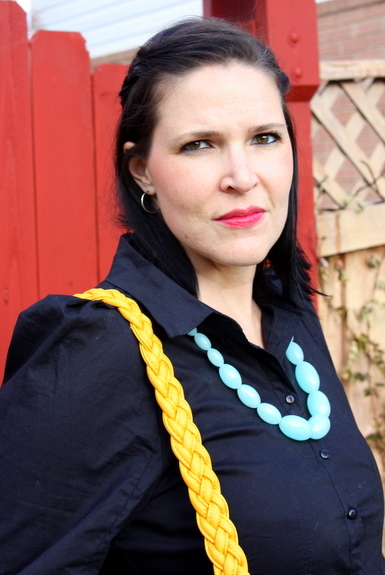 that turquoise necklace looks great against the black – almost glowing! Thanks Andrea! That necklace is the best $8 I’ve ever spent; I wear it all the time. I’m wearing a black sweater! over grey shirt with blue jeans and tan leather boots (Frye boots…Merry Christmas to me :) that necklace rocks! love it with the lip color, and the black outfit is the perfect back drop for all the colored accessories. and is that a braid in your hair? :) How about a post on hair braids? how to and how not to wear them… sometimes I feel childish with a braid–not sure I’m doing it right. Oh you stylish girl you. I love it. Frye boots are on my life-long wish list. Don’t ever feel childish about wearing a braid in your hair, they’re gorgeous! Thanks lady, love the bracelet. Downton Abbey rocks my world. I’m TOO excited for the new season to start in just a few days!!! Oh, hold me. I can’t get enough of it! I just wanted to say, I’m glad you are back. Missed your posts over the holidays! Alecia, I missed you too! And thank you, truly. Great look! i love the sleeves on your tunic, very feminine. Thank you! The sleeves are what sold me, I love them. Look at you being all fierce. Tyra would love that last pose! Seriously, I look like I’m about to eat my husband! Ha. Loving how your necklace and bag really pop against that black on black! Thank you! I love color contrast in outfits, don’t you? Just seeing this, what a fun surprise to see you with your bag! Thanks friend. Can’t wait to see you soon!!! Maile, we are having lunch next week. Period, the end.